This is how Dicky Clymo, emeritus professor at Queen Mary University of London, came into my life. First, he taught me about iron pans in peatlands. Second, he taught me that calling someone who is conveying a false statement a liar has implications (difficult to know and/or prove) over a) the person’s knowledge of the truth, and b) the person’s intention to confuse, manipulate or cheat her audience. A polite gentleman, he advised me to use instead the phrase that X manager was misrepresenting Y or Z fact or opinion. I have tried to stick to that advice ever since. Even when X manager knows she is misrepresenting and intends to cheat, there are still good reasons not to call her a liar. First, because it is not trivial to prove an individual’s intentions. Second, it can be unhelpful for those listening: in addition to the question what is the truth? they now need to also answer why is Fanis accusing the manager of having bad intentions? Take for instance the example of the restructurings at my former university. First, its “Senior Executive” effected them at different times on different Schools, claiming that each School should have a demonstrable positive income. (I suggest the Law should be clearer in demanding that the Employer shows that the whole institution is in need of cost-cutting, not only a certain part of the whole.) Thus, an institution declaring surplus of £17M was destroying people’s careers justifying savings of less than £2M. Even if the accounting were true (who checked?) and the Medical School was in deficit (a very unlikely situation), the point is that no scrutiny is put on the University managers to be honest and transparent about their pronouncements. Many colleagues have asked: why would the College wish to obtain & declare suprlus? One answer is: for it wishes to borrow money and to do so, it needs to demonstrate to the bank that it is in good standing to pay back the installments. And why is this bad, since the University will borrow for a good reason? I will not expose again beyond one sentence the multiple crimes against humanity that take place while managers restructure. Valuable teachers disappear, excellent research programmes that took decades to build up get cancelled, esteemed members of the society end up in hospitals with diseases ranging from depression to cancer or takeing their own lives, while those remaining behind turn into cynic bastards, cruel bosses, unsharing brutes or psychological relics and students learn that such situation is normality. Avoiding all of the above is a good reason not to generate huge surplus. Mural de Diego Rivera, “Gloriosa Victoria”. 1954. I say something has gone very wrong with the UK higher education sector. Not a good start for the new Principal and President of Queen Mary. He sounds like a Chief Executive Officer. 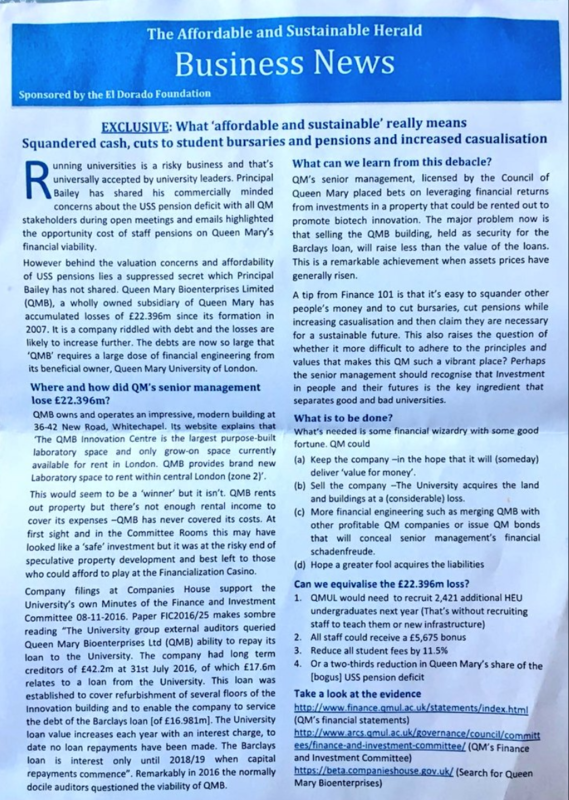 Queen Mary Bioenterprises Limited. There’s a huge scandal behind it, and most likely it relates to much that has been written in this blog.